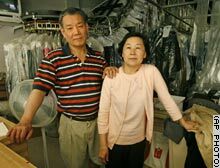 We learned more this week about the lawsuit by a D.C. administrative law judge against his diabolical neighborhood dry cleaners, who allegedly lost or stole or set fire to or irradiated or otherwise acted tortiously towards a pair of pants that he dropped off for cleaning four years ago. yields a total of $64,800,000. It is not clear yet how the judge derived 12 violations from one pair of pants, so assuming he is just a bit optimistic there, a more reasonable lost-pants valuation would seem to be $5.4 million. A new detail is that an additional $15,000 was claimed in order to compensate the plaintiff, who obviously can no longer use this neighborhood cleaners, for the cost of having to rent a car each weekend for a ten-year period in order to go to another one. Based on rough calculations, that comes out to just $15.64 per day, which again is a very reasonable value for car rental. The remaining $647,500 claimed by the judge appears to be a combination of litigation expenses and time, and his "mental suffering, inconvenience and discomfort." At least some of the "discomfort," however, may be due to the alternative cause of the judge's pants having become "uncomfortably tight" in the first place, damages that he could have mitigated. Finally, the publicity over the lawsuit has led some of these unscrupulous Internet people to dig up the opinion from Judge Pearson's divorce proceedings a few years ago, in which he was demanding support from his wife. Consistent with his current tactics, he sought sanctions at least twice, demanded the judge recuse himself, filed multiple motions to compel his wife to respond to his 248 requests for admission, and, according to the trial judge, "in good part [was] responsible for driving up" everyone's legal costs, "including threatening both the wife and her lawyer with disbarment" which created "unnecessary litigation." No news yet on whether Judge Pearson, who is up this week for another ten-year term as an administrative law judge, will be reappointed.